With snow piled high and nights starting early and ending late, winter is in full swing in Alaska. The cold can be unforgiving and often drives us inside. Luckily, this is not a problem that is new this year or last. Residents of Anchorage have a variety of cures for the winter blues, and the high point every year is the Fur Rondy celebration. Hotels fill up and people from all over Alaska gather in downtown Anchorage for festivities, warm bonfires, and sled dog racing. Originally, Fur Rondy was celebrated around the time that trappers and miners came into town to sell their product. This had the dual effect of not only gathering people, but gathering people during good times. 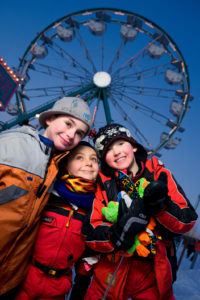 The Rondy quickly turned into a full-fledged festival which today includes fireworks, a fur auction, world championship sled dog races, a carnival, melodrama, and too many other daily events to list. Over time the event’s time span spread beyond its initial 3-day limit. Today the Fur Rondy lasts two weeks, and this year it is between February 24th and March 5th. The final day marks the start of the world famous Iditarod Sled Dog Race. Several events at the Fur Rondy are quite unique and can’t be experienced anywhere else. Each year they hold the Running of the Reindeer – an event similar to but calmer than that of Pamplona’s running of the bulls. The fireworks show is the largest in the state and the day on which it falls it is affectionately known as fireworks night. Places to see the fireworks fill up quickly and restaurant reservations can be hard to come by! Therefore, bundle up and head out early to make sure you find parking. Check out the events schedule here. Attendees every year can purchase a commemorative Fur Rondy pin. Look around for people with several pins on, as many locals have been visiting every year for decades, take great pride in their collections, and happy to show them off. Perhaps you can start your collection this year! ← Now is the time to Ski in Alaska.